Open classes are for ballet and flamenco dancers 11 and older. Price is $16 per class or $150 for class card. We take checks, cash, or Visa/Mastercard. A special discount for open ballet classes is offered to students who are registered for the 2018/2019 school year. Any Just Adults or Adult/Teen Ballet class can be taken as a drop-in class for $20. Adult/Teen Jazz can be taken as a drop-in class for $25. Additionally, 10 and 12 week session beginner and intermediate registered adult/teen classes are offered in ballet, jazz, and tap during the school year. Please visit the Adult/Teen Page and the Adults Beginner Ballet page. 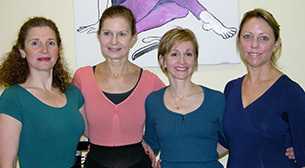 We have opened up our Adults Beginner Ballet and Adult/Teen Jazz, classes to drop-in students. See drop-in rates and registration below. Please note that class cards cannot be used for Jazz, Adult/Teen Ballet or Just Adult classes. The above classes are not offered over the summer. Mondays 11am – 12:30PM Lisa Bottalico. Cost is $16 per class, or just $10 per class for students registered for the summer intensive or the 2017/2018 school year. You may pay via the link below, or when you arrive to class. pre-registration/payment is not required. This is the regular Monday Open class which will continue through the holiday break. Cost is $16, or $10 for registered PDT students). PDT school-year classes resume on Wednesday, September 12. Regular Monday morning open ballet classes resume Monday, September 10 (9:30-11:00 AM). Please note that the Monday morning class will be suspended from June 25th thru August 10th.